Music and the power of sound is like a secret world that opens up many doors to possibilities because of its universal nature, the impact it has on the brain's neural functioning, the deep-rooted cultural—and even tribal—roots, how it powerfully expresses the characteristics of the organizational system, its broad palette of creative possibilities, the relatively limited use of it in organizational learning, and... it can be a lot of damn fun. to listen to Face The Music's version of "Got My Mojo Working") and what organizational learning needs is a little more mojo! The mojo spirit can be engaged by the use of music. There is an enlivening dimension that can contribute to comprehension and learning transfer back to the workplace. , Daniel J. Levintin says, "Listening to music causes a cascade of brain regions to become activated. Effective music—groove—involves subtle violations of timing. Our cognitive system interprets these vibrations as a source of pleasure and amusement. This emotional response to groove occurs via the ear-cerebellum-nucleus accumbens-limbic circuit rather than the ear-auditory cortex circuit." What the heck does that mean?—It means our response to groove is largely pre- or unconscious. There is also significant activity in brain centers governing memory and emotion. Without going into a detailed report of the brain science involved, let's just say that this gives us some interesting potentials for engaging in learning, and for the transfer of learning to behavior back on the job, which is the key to fulfilling the purpose and promise of training and organizational engagement. On the one hand, there are some sound scientific principles to be applied, and then there is the art of the "show," the intangibles of delivering with the balanced share of structure and freedom, keeping it loose, but not getting too silly, inviting authentic emotion and expression. • The high quality of your musicians; your professionalism in managing a huge number of teams and participants in this exercise. • The debriefing after the exercise, to understand the "mood" of the participants, what went right or wrong with them, what it reflects about our organization. This was valuable in our discussion on our strategy for our company"
"The program served to bring a higher sense of identity for us, and the passion and energy of it transferred to the work we did on the strategic elements the next day." "I had the opportunity to attend a training program up at O&R on Friday. It was called "Face The Music... Beating The Corporate Blues." What an incredible experience it was. I went up regretting my commitment to attend particularly facing the traffic on the Tappan Zee... but I can tell you that I have never attended a program that left me feeling so good at the end of it. And I am so glad that I did attend." "Remember when you were a kid you got your first small box of Crayola Crayons with five or six primary colors. The first thing you did was enjoy the smell and then you feverishly colored everything in sight. You soon became bored with the limited colors provided in the box and stop being creative. Now think back to when you got the really big box with every color in the world. The crayons were layered in stadium style with limitless opportunity for creativity. Face the Music is the "big box of crayons". We have all become bored with the tools provided in the work place. We need a bigger box of crayons!" Almost any activity that involves self-assessment or interpersonal interaction may be used as the "doing" part of experiential learning. After participants have experienced an activity, they are ready to share or publish what they observed and how they felt during that experience. (This is the pivotal step in the experiential learning cycle). This step, referred to as the group dynamics stage, includes systematic examination of shared experiences by the members of the group. In this stage, the members of the group begin to focus on their awareness of situations in their personal or work lives that are similar to those they experienced in the group. "How is this like the rest of your life?" In this final stage, the facilitator helps participants apply generalizations to actual situations in which they are involved. Anything that the system produces reveals information about that system, and experiential learning is a powerful tool to help reveal the characteristics of a system, and give the participants self-awareness insights that can be applied to consciously evolving their operational system in conjunction with the other members of that system. 1. In the distant future a group of employees (lead by our main character) at a large corporation are given the task of deciding where the next company conference should be held. They are given three choices, one of the choices having an absolute advantage over the other two. They of course choose this option, which is to go the most beautiful planet in the galaxy known as Kepler 69. 2. Our main character wakes up in a hotel in the present of July 2014 in Corning NY only to realize that it was all a dream. He is actually at a company conference and has to get up to be part of the days activities. Flash to the evening. The conference members are all at local museum/dance studio for drinks, dinner, and an unknown team-building event that involves music. Our main character dreads the events to come (even though he is not sure what they are).
) after which, the bass player, a tall fellow with a small bass guitar (it makes him look even taller), speaks. He makes a business case for writing a song about our objectives of this particular conference and then we will be performing it with the band on stage. Each table in the room is now a band and is to write a song. I am pretty nervous and I have never been on stage before or written any music. But, somehow the process that is delivered makes it effortless. "Maybe I shouldn't have tried our new anti-depressant today," I think to myself. We came up with a theme and wrote the song (it was easy and fun). "We sound like one of those 1960's British Invasion bands," I said. Part of our assignment is to come up with a name for our "band." I suggested the Minions (from my dream), but we need a name that fits the era like the Beatles, The Troggs, The Animals, or The Monkees, etc. What about "The Lizards?" suggested a team member. We unanimously agreed. We get announced and take the stage with quite an impressive band that Face The Music has provided. All we do is have to sing or even speak our lyrics. At this point, I had had another drink and things were becoming rather fuzzy. The drum hits and the song begins. Suddenly, the stage floor is about 4 inches from my head and the crowd is going crazy. Next to me is my band mate's shoe and it smells like "@#@$%". The sound of the drum has become much louder. My neck feels different and I can barely see off the stage. I must have fallen or something. I look up and see a hand reaching down to me. It belongs to one of my teammates. As I am blinking continuously, I say to myself, "Oh my god! What happened?" I, then feel a hand on my back. Next thing I know, I am being lifted. Everything looks so big as I get to his chest height. I jump and I'm stationed between his shoulder and soft pectoral (this guy needs to work out). The song ends. As he carries me off stage, I turn to look at his hand, which is holding me by my back. "John". I hear the hand clap again (no echo this time). I open my eyes and there is Tina, she's my therapist. "Okay John, now take a deep breath," she said. It is 's quiet in this room, no band playing and I look down at my legs and I have pants on and no tail. " You were in a deep hypnotic trance John, I snapped you out of it when you were starting to mumbling something about lizards and sticking your tongue out at me," said Tina. I paused to gather my thoughts. We talked about Kepler 69, the Corning Conference, and time travel, all a result of her hypnotic therapy." John, you know you're a successful head of your one of the biggest pharmaceutical companies in the world. In our journeys, you've put yourself in the shoes of most of your company's positions from an employee to a board member. "Have you learned anything about your fear deciding on what is best for your company's longevity?" Tina questioned. 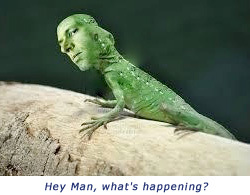 John paused and said, " Well, song writing events are fun even if you do turn into a lizard."